Superior Grip is achieved with our Patented hexagonal surface pattern as well as the pronounced ribbing on the front and back of the magazine. This combination provides a comfortable and sturdy grip when completing magazine changes. The Hexmag Anti-Tilt Follower was engineered with equal length legs to prevent tilting forward or backwards keeping the ammo in a straight double stack for reliable feeding. The High visibility, Hexmag Orange Follower allows for safer clearing of your rifle’s chamber. Tool Free Design, no tools or bullet tips are needed to remove the base plate and disassemble the magazine for cleaning or changing the HexID color identification system. 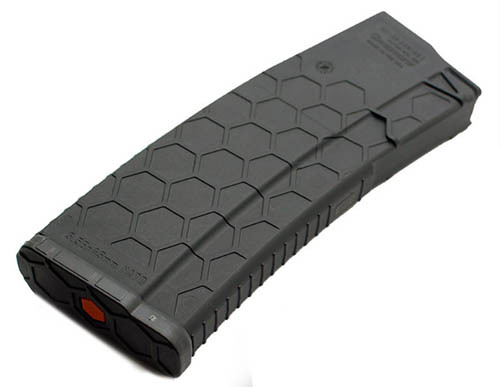 Hexmag magazines feature a Fiber Reinforced Polymer Construction that is lighter than other leading AR-15 magazines. Perfect for competition shooters looking for weight savings. 5.56 x 45 NATO / .223 Remington, 300AAC Blackout approved, (both supersonic and subsonic .300AAC blackout ammo) .458 SOCOM and .50 Beowulf tested working by independent manufacturers.